At the heart of AudioSnap are transient markers. SONAR automatically detects transients for all audio clips in your project. Although you can also edit transient markers with the Select tool, Move tool, Timing tool, Split tool, Freehand tool, Erase tool and Mute tool, this chapter focuses on the Smart tool since it is the easiest way to edit transient markers. In order to edit audio transient markers, you must assign a track’s Edit Filter to Audio Transients (see Selecting the data type to edit). Assign the desired track’s Edit Filter control to Audio Transients. All audio clips show transient markers and the AudioSnap palette appears. Note: Displaying transient markers does not mean that AudioSnap is enabled. AudioSnap is only active on a clip when at least one transient marker has been stretched. If you select another data type in the Edit Filter, transient markers will no longer be visible and the AudioSnap palette closes. The following table describes how the Smart tool behaves when interacting with transient markers and clips. Selects the clip and opens the AudioSnap palette. Opens the transient marker context menu. Opens the AudioSnap context menu. Selects transients from other tracks (from selected clips) that fall within a certain window of time of the transient the user is clicking on. If no clips are selected, only non-hidden tracks are affected. Non-proportional stretch with selected transients. Note: You can drag a marker from either the head or the line of the marker. Drag the line to stretch a marker and drag the head to move a marker. Lasso selects transients to add to the current selection. Adds transient marker to current selection. Like double-click, but adds transients to the current selection. Like double-click, but extends the range of selected transients. Inserts a new transient marker. Manually inserted transient markers are slightly shorter than auto-detected transient markers. Figure 293. Smart tool hotspots on AudioSnap transients. For more information about editing transient markers, see Editing transient markers. Select markers. Use this submenu to select transient markers that meet specific criteria. Set project tempo from clip. This command copies the clip’s tempo map to the project’s global tempo map. This allows the project’s measure boundaries to align with the audio clip. Whenever the project’s tempo map is generated from a clip, the clip’s Lock Position property is enabled automatically. Set clip tempo from project. This command copies the project’s tempo map to the clip’s tempo map. This allows the project’s measure boundaries to align with the audio clip. Clip follows project tempo. This command forces the clip to follow the project’s global tempo map. Note: The Clip follows project tempo command only works on clips that are configured to use musical time (the Time Base property is set to Musical in the Clip Inspector). Edit clip tempo map. Each audio clip has an internal tempo map. This command exposes controls that allow you to edit a clip’s tempo map. For details, see Editing a clip’s tempo map. Merge and Lock Markers. This command combines all transient markers on all selected tracks, so that all selected tracks share identical transient markers. The clip positions are also locked. This will ensure that phase relationships are maintained when quantizing or moving clips across multiple tracks. 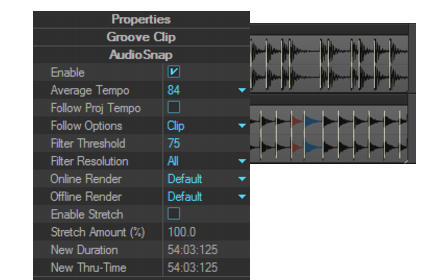 When using the Smart tool to drag transient markers, all transient markers at exactly the same point in time on selected clips move together as a group. Save as Groove. This command opens the Define Groove dialog box, which lets you save the groove to a file. The groove can then be applied to other audio or MIDI clips. Copy as MIDI. This command saves the selected audio as a MIDI clip, which you can paste from the Clipboard into a MIDI track. You select the MIDI note that the transients in the audio clip will be converted to in the AudioSnap Options dialog box, which opens when you click the Options button. Quantize. This command opens the Quantize dialog box, which has options to quantize AudioSnap Beats and Audio Clip Start Times, and also to set automatic crossfade options. Groove Quantize. This command opens the Groove Quantize dialog box, which has an option to quantize AudioSnap Beats, and controls to set automatic crossfade options. Pool > Add MBT to pool. The Track view Time Ruler can be added to the Pool (see Using the Pool). This command adds the current Musical Time snap resolution to the pool, and also displays dotted pool lines in the Clips pane. This can be useful as either a basic visual guide, or for adding the Musical Time to an extracted groove, or to fill in any transients that may be “missing” in a syncopated or sparse section. In the Control Bar’s Snap module, set the Musical Time value to the resolution you would like to add to the Pool. Pool > Add clip to pool. This command adds or deletes the clip’s transient markers from the Pool. The markers do not have to be visible to be added to the Pool. See Using the Pool for more information. Pool > Show pool lines. This command hides or shows the Pool lines. Pool > Apply transient pool markers. This command insert new transient markers that correspond to the Pool markers. Pool > Quantize to pool. This command quantizes the selected clips to the Pool. Enable AudioSnap. This command enables or disables AudioSnap on selected audio clips. In addition to the AudioSnap palette, you can also edit a clip’s AudioSnap settings in the Clip Inspector. For details, see Properties Inspector - Clip Properties. Figure 294. The AudioSnap section in the Clip Inspector.